Need help finding your perfect wedding dress? Do you have a question you need answered? Maybe you have a comment or suggestion you would like to make. Do you have suggestions for new pages about topics you would like covered? Then feel free to contact me. I respond to all requests. 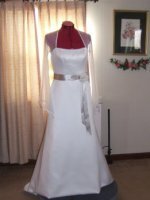 Note: If you are interested in a particular dress picture on this website, please let me know the url address of the article you see the gown displayed. I respond to request within 24hrs. If you have not heard from me please check your spam folder or if this email address is whitelisted.